Find some inspiration for your own big day, or just get lost in the prettiness of these Tarun Tahiliani outfits on real brides. He weaves together Indian craftsmanship and textiles with flattering silhouettes and trendy styling. Little wonder then that couturier Tarun Tahiliani has been one of the 'go to' designers for Indian brides for over a decade. Here, we present 15 Real Brides who looked resplendent in his creations that exude timeless sartorial appeal. Brides Samhita Phukan, Tanvi and Harsha Rupani sidestepped the traditional red for their wedding lehengas, opting instead for this stunning coral ensemble. Featuring rich zardosi and resham booti embroidery, this lehenga was paired with a net dupatta and featured short sleeves in deep teal. Bride Nisha Hemlani sported a pre-stitched concept saree in red, yellow and pink with a modern strappy blouse for her Japanese ‘Floral Fujiyama-themed’ mehndi function. Her mint green lehenga mirrored the vibe of her seaside beach wedding with its ‘surf wave’ blue and sandy gold accents. Bride Archana Vijaya, who is an anchor and VJ, refreshed the traditional bridal palette with this standout ensemble. The elegant motifs of the Mughal era found haute expression in Bride Rasna’s wedding lehenga with its floral designs on the pearly skirt and purple choli. This work of art was paired with a contrasting crimson dupatta featuring a broad border that mirrored the motifs in the rest of the ensemble. Bride Payal Shah’s beauty blossomed anew in a pink and red lehenga with floral motifs that she wore for her mehndi ceremony. Evoking the essence of spring, this creation was all about femininity, romance and gentle buds that evoke new beginnings. Bride Shalini customised her rich fuchsia lehenga with 16 panels, each with a subtly different colour ranging from baby pink to peach and coral. 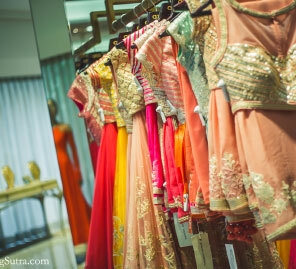 Complementing the hues were intricate stone and mirror work with kundan embroidery. Reminiscent of white wedding gowns, Bride Ashni’s ivory tulle lehenga for her sangeet featured charming layered gold and brown accents. The elegant ensemble paired dramatically with her bold gold net blouse. Bride Priya Narwani looked ravishingly different at her fun mehndi ceremony by the poolside where she rocked her contemporary, colorful pre-draped saree with elan. Bride Nisha Hemlani’s green and magenta lehenga matched the groom’s emerald sherwani as they walked down the aisle to the outdoor mandap. The fine gold thread embroidery and embellishments added a regal touch to her daytime wedding look. 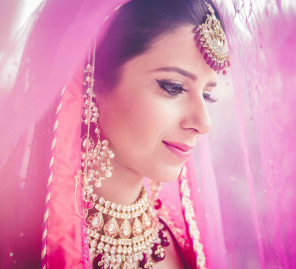 Bride Khyati Modi chose a traditional pink and red lehenga for her pheras. This lovely ensemble featured Tarun Tahiliani’s hallmark exquisite gold embroidery all the way from hip to hem. Bride Sukanya Shah paired her rich brocade blouse with her ivory and maroon lehenga for her pheras. Her pearly kundan and gold jewellery, and hair bun encircled with white flowers tied the whole look together neatly. Featuring the rich texture of all-over embroidery in magenta, green and light ochre hues, Bride Moulika’s ornate lehenga was paired contrastingly with a light olive green dupatta. This peach and red ombre lehenga with gold embroidery made Bride Aakanksha Baldota a style star at her reception. Her short sleeve blouse with charming shoulder tassels had contemporary white borders that matched her sophisticated white necklace beautifully. The traditional Indian wedding colors of orange, red and gold merged beautifully in bride Pooja Halwasiya’s lehenga. Her blouse featured a deep neckline that allowed her to flaunt her multiple necklaces that were coordinated skillfully to look just right. Coral was the color of choice for Bride Manvi whose lehenga featured interesting details such as a striped layered hem with festive colors, paisley motifs in jaali work and festive floral patterns all through.